ALL hopes are now on the FA Cup and League title after last season’s quadruple winners saw another of their major titles slip away. A record League Cup crowd of more than 5,000 watched Everton overcome a lacklustre Arsenal at Leyton Orient on Thursday night. Amy Kane coolly put Everton ahead after seven minutes and the Toffees’ determination to lift a first trophy in 10 years carried them through the game. Arsenal are in County Cup semi-final action this weekend and go into the match against Charlton on the back of a 4-0 win over Leeds United on Sunday. Lianne Sanderson (2), Rachel Yankey and Julie Fleeting scored to keep Arsenal at the top of the table. 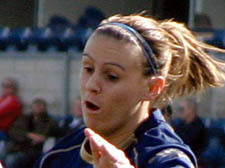 Striker Fleeting (pictured) was named Sports Personality of the Year at the Field In Trust awards for her 100 caps for Scotland. TWO goals from Jessie Richards set up Spurs’ best performance of the season on Sunday. The home side were 3-0 up at the break as Clare Singh and Hannah Charman scored from well-taken corners. Richards pounced on the Woking defence for the killer third and added a fourth after the break when she coolly rounded the keeper. Striker Rosi Webb completed the rout to keep the team in touch with the top. KATS came back from behind to see off East Barnet on a windy afternoon. Chelsea Berlin cancelled Barnet’s early opener and Helen Frazier put Kats ahead in the second half. Barnet rallied with an equaliser but new girl Beth Bergmann hooked in from the edge of the box for 3-2 and an own goal finished it. A BRACE from Nell Tindale and a player of the match show by fellow goalscorer Isabelle Hnat set up Hampstead. Goals from Shauna Lawless and Milly Pope coupled with an own goal sealed the win. GOALS from Abby Mills (2), Lotte Bridgham (2), Lauren Lucas, Gemma Prince and a corker from player of the match Maddy Payne put Hamps in seventh heaven on Sunday.